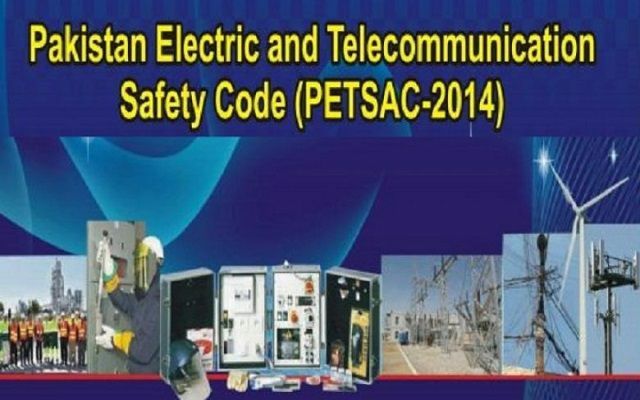 Pakistan Engineering Council (PEC) introduced the Pakistan Electric and Telecommunication Safety Code (PETSAC-2014) for protecting human lives and reducing material loss from electrocution and associated perils, at a ceremony in Islamabad. Minister for Science and Technology Rana Tanveer Hussain while speaking at the occasion said that code would only be effective, when all the related regulators would develop effective appliance within their realms to confirm its execution. Rana Tanveer further added that PETSAC will assist in fetching foreign investment and partnership by providing globally recognized safety practices applicable in power and telecommunication sector in Pakistan. The Minister praised the honest and persistent hard work of PEC in enhancing engineering profession overall, particularly the latest triumph of recognition of engineering qualification and cross border mobility in Asia Pacific Region as announced by Federation of Engineering Institutions of Asia and Pacific (FEIAP) and certified by UNESCO. He stated that this accomplishment would undoubtedly pave the way to open international job avenues for Pakistani engineers. Engr. Jawed Qureshi, Chairman PEC in his welcome speech revealed that PETSAC-2014 offers an integrated system of safety standards to help lessen lethal and non-fatal occupational accidents among directly exposed workforce, general public as well as to contribute to the safety of treasured possessions of the concerned services. Chairman PEC explained that the Code shall be accessed by all public and private organizations in power and telecom sector while execution and administration of this Code shall confer with regulators such as National Electric Power Regulatory Authority (NEPRA), Pakistan Electronic Media Regulatory Authority (PEMRA), Pakistan Telecommunication Authority (PTA) and Pakistan Engineering Council (PEC) within their own spheres. Mission Director USAID in Pakistan John Groarke said USAID is collaborating with Pakistan in energy, science and technology, and other fields. He said USAID will continue collaboration with Pakistan in meeting its energy requirements. Engr Dr Akbar Deputy Convener, PEC Task force on development of PETSAC informed that PEC confirmed membership from different investors with monetary support from USAID-Power Distribution Program, Pakistan to develop PETSAC-2014, which was positively framed after two years of determined efforts. Dr Akbar further said that it was a great honor for PEC that these codes were globally recognized by IEEE-SA. He also said that this code will offer rules for safe practices in design, installation, operation and conservation of electric supply and telecommunication systems.